The 30th anniversary of Wine Spectator’s Restaurant Awards program sees five new Grand Award winners join the ranks of the world’s greatest wine lists. A look at how wine service has been transformed in the past three decades, and what lies ahead. California Sauvignon Blanc: A free chart offers an alphabetical list of all California Sauvignon Blanc wines reviewed for the tasting report in this issue. Evolution - Wine culture in dining rooms in the United States and abroad has advanced markedly since our first Restaurant Awards were given, in 1981. A look at what’s happened, and why. 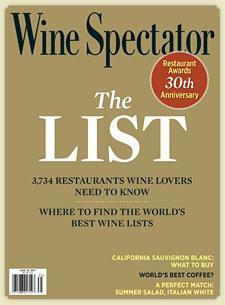 WineSpectator.com: FREE ACCESS: Complete listing details for all award winners are available in our free online Restaurant Search, where you can select by location, award level, wine strengths, cuisine type and more. WineSpectator.com: Free access to the complete Dining Guide, with full listings for all award-winning restaurants, is available in our Restaurant Search, which allows you to select by location, award level, wine strengths, cuisine type and other criteria. WineSpectator.com members can also post their own personal ratings and share comments about the quality of their experience at these restaurants. WineSpectator.com: More than 170 wines were reviewed for this report. A free alphabetical list is available. WineSpectator.com members can access complete reviews for all the wines tasted using the online Wine Ratings Search. WineSpectator.com: For more details about the 2011 vintage in Australia, New Zealand, South Africa and South America, read our full reports. Lights! Camera! Pour! Video Contest! WineSpectator.com: In his latest blogs, James Laube shares notes on two verticals of Schrader Napa Cabernet, highlights a classic Sonoma County appellation Syrah and finds common ground with a Napa vintner whose hobby is long-distance swimming. Join the conversation. RESTAURANT SEARCH Our complete 2011 Restaurant Award listings, with nearly 4,000 wine-loving restaurants, are searchable in our free online database. SOMMELIER TALK Meet the people behind the great wine lists: Find out their favorite pairings and which wines make it into their own cellars. 2011 VIDEO CONTEST Creative with a video camera? Submit your shorts to Wine Spectator's fifth annual video contest and you could win great prizes. Our editors will select the best, and the finalists will be posted on WineSpectator.com, where viewers will vote for the winner. The deadline to enter is Aug. 31. Find everything including rules and previous years finalists. Bordeaux Values: How can you find delicious Bordeaux that doesn't break the bank? Join James Molesworth as he shares some of his favorite values from the region. Piedmont Reds and Whites: Learn more about this Italian region and its signature wines, including Barolo, one of the world's great reds, and Arneis, a white brought back from near-extinction. ASK DR. VINNY Have questions about wine? Our saucy expert addresses everything from the technical aspects of winemaking to the fine points of etiquette. RESTAURANT RATINGS Have your say on the winners in our 2011 Restaurant Awards program. Our Restaurant Search ratings system lets you hand out stars and comment on your favorite dining spots. PERSONAL WINE LIST Create shopping lists. Organize your purchases. Track the contents of your cellar. Print shelf tags. Use the PWL to create as many lists as you need, add rated and unrated wines, and get updates on the value of wines in your collection.